Renders one or more lens flare images over the background clip, aligning various flare elements between the hotspot and pivot locations. 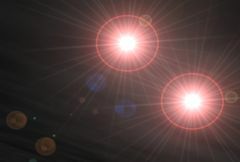 In this AutoTrack version of LensFlare, the hotspots are automatically positioned on the brightest areas of the background clip. Increasing Blur For Auto will cause the input to be smoothed before the brightest locations are found and can help remove the effect of secondary bright spots. In the Sapphire Lighting category. Source: The current track. The clip to apply the lens flare over. Track: Optional. The lensflare hotspot is positioned on the brightest part of this image. If this input is not selected, the current track is also used for the tracking. Occlusion: Optional. Obscures and colorizes the flare. The brightness of the flare is reduced based on the opacity of this clip, and the color at the hotspot location is used to tin the flare . These behaviors can be adjusted with the Occlusion Softness, Occlusion From, Invert Occlusion, and Use Color parameters. Background: Optional. Composites the Source and lens flare over this clip. Lens: Default: 0, Range: 0 or greater. The type of lens flare to apply. Custom lens flare types can also be made, or existing types modified, by editing the "s_lensflares.text" file. Scale Widths: Default: 1, Range: 0 or greater. Scales the sizes of all the flare elements. This parameter can be adjusted using the Scale Widths Widget. Rel Heights: Default: 1, Range: 0 or greater. Scales the vertical dimension of all the flare elements, making them elliptical instead of circular. Rays Rotate: Default: 0, Range: any. Rotates the ray elements of the lens flare, if any, in counter-clockwise degrees. This parameter can be adjusted using the Rays Rotate Widget. Max Hotspots: Integer, Default: 1, Range: 1 or greater. Maximum number of flares to render. Rendering multiple flares can give different tracking results than rendering a single flare. Hotspot Threshold: Default: 0.6, Range: 0 to 1. Flares are drawn at locations in the source clip that are brighter than ths value. Track Color: Check-box, Default: off. If enabled, the color of each hotspot will be adjusted to match the light source it's tracking. Hotspot Shift: X & Y, Default: [0 0], Range: any. Adds this amount to the hotspot locations. This allows for a relative adjustment of the hotspots away from the auto-tracked locations if necessary. Pivot: X & Y, Default: screen center. The elements of the flare will be in a line between the Hotspot and the Pivot locations. The Pivot is in screen coordinates relative to the center of the frame. This parameter can be adjusted using the Pivot Widget. Scales the color of all flare elements. Scales the brightness of all the flare elements. Gamma: Default: 1, Range: 0.1 or greater. Increasing gamma brightens the flare, and especially boosts the darker elements. Scales the color saturation of the flare elements. Increase for more intense colors. Set to 0 for a monochrome lens flare. Hue Shift: Default: 0, Range: -1 to 1. Shifts the hue of the flare, in revolutions from red to green to blue to red. Hotspot Color: Default rgb: [1 1 1]. Scales the color of the hotspot elements only. Hotspot Brightness: Default: 1, Range: 0 or greater. Scales the brightness of the hotspot elements only. Rays Brightness: Default: 1, Range: 0 or greater. Scales the brightness of the ray elements only. Rays Num Scale: Default: 1, Range: 0 or greater. Increases or decreases the number of rays. Rays Length: Default: 1, Range: 0 or greater. Adjusts the length of the rays without changing their thickness, or changing the size of the other flare elements. Rays Thickness: Default: 1, Range: 0 or greater. Adjusts the thickness of the individual rays within the flare. Other Color: Default rgb: [1 1 1]. Scales the color of all flare elements that are NOT at the hotspot location. Other Brightness: Default: 1, Range: 0 or greater. Scales the brightness of all flare elements that are NOT at the hotspot location. Other Width: Default: 1, Range: 0 or greater. Scales the width of all flare elements that are NOT at the hotspot location. Atmosphere gives the effect of the flare shining through a dusty atmosphere and picking up light or getting shadowed. This parameter adjusts the amount, or amplitude, of the atmospheric effect. Zero gives a smoother flare, higher values give more dirty look. Atmosphere affects some parts of the flare but not others. This behavior can be adjusted for each element by toggling the Ignore Atmosphere setting within the Flare Designer. Typically, elements which originate within the camera (such as secondary reflections) should use Ignore Atmosphere, while elements which originate outside it (such as glows) should not. Flicker Amp: Default: 0, Range: 0 or greater. The amount of random flickering of the flare brightness. Flicker Speed: Default: 1, Range: 0 or greater. The speed of random flickering. Flicker Randomness: Default: 0.6, Range: 0 to 1. Controls the variability of the flicker. When set to zero, the flare will flicker constantly, with a small amount of random variation. At higher values, the flickering will have longer steady spells, with the occasional large spike. Blur Flare: Default: 0, Range: 0 or greater. If positive, the flare image is blurred by this amount before being combined with the background. Scale Source: Default: 1, Range: 0 or greater. Scales the brightness of the source clip before combining with the flare. If 0, the result will contain only the flare image over black. Determines how the flare image is combined with the source image. Add: causes the flare image to be added to the source. Flare Only: gives only the flare image with no background. Tint Bg Whites: Check-box, Default: off. If this is enabled, the chroma of the flare is added only after the result is clamped to the maximum brightness. This allows the color of the flare image to still be visible even over bright white backgrounds. For the majority of backgrounds there will be no observable difference. Blur For Auto: Default: 0.1, Range: 0 or greater. Used only if the effect is set to AutoTrack. The input is blurred by this amount before finding the brightest location. Affect Alpha: Default: 0, Range: 0 or greater. If this value is positive the output Alpha channel will include some opacity from the flare. The maximum of the red, green, and blue flare brightness is scaled by this value and combined with the Background Alpha at each pixel. Edge Width: Default: 0, Range: 0 or greater. Creates a trigger zone at the edge of the screen which affects the brightness and size of the flare. This parameter controls the width of the zone. Setting it to zero will disable Edge Triggers. Edge Falloff: Default: 2, Range: 0.01 or greater. Controls the speed with which the intensity of the trigger decreases when moving away from the edge. A value of 1 results in a linear ramp. Values greater than one result in a steeper initial drop which gradually levels out. Values less than one result in a slope that starts gradually and gets steeper at the end. Shifts the trigger zone outward from the edge of the screen, placing the peak off-screen. Negative values will shift the trigger zone inward toward the center of the image. One Way: Check-box, Default: off. If this box is checked, the trigger will stay at maximum intensity when the Hotspot moves off-screen, instead of ramping back down as it moves farther from the edge. Edge Scale Brightness: Default: 3, Range: 0 or greater. Scales the Brightness by this amount when the trigger is at peak intensity. For example, a value of 3 will cause the flare to ramp up to 3 times its normal brightness as it passes through the trigger zone. If less than 1, the trigger will dim the flare instead of brightening it. Edge Scale Widths: Default: 2, Range: 0 or greater. Scales the width of the flare by this amount when the trigger is at peak intensity. For example, a value of 3 will cause the flare to expand to 3 times its normal size as it passes through the trigger zone. If less than 1, the trigger will shrink the flare instead of growing it. Show Edge Zones: Check-box, Default: off. Overlays the output with a grayscale image which shows the location intensity of the Edge Triggers. Center Radius: Default: 0, Range: 0 or greater. Creates a trigger zone centered on the Pivot which affects the brightness and size of the flare. This parameter controls the radius of the zone. Setting it to zero will disable Center Triggers. Center Falloff: Default: 1, Range: 0.01 or greater. Center Scale Brightness: Default: 2, Range: 0 or greater. Center Scale Widths: Default: 1.5, Range: 0 or greater. Show Center Zone: Check-box, Default: off. Overlays the output with a grayscale image which shows the location intensity of the Center Trigger. Occlusion Softness: Default: 0.0224, Range: 0 or greater. Increase this value to make the flare to fade out gradually as the Hotspot moves behind an object. Set it to zero to have the flare wink out suddenly. With large softness values, the Hotspot position is automatically adjusted toward non-occluded areas. This accurately simulates a large light source which is partially obscured, and it prevents the Hotspot from appearing in front of an occluding object. Occlusion From: Popup menu, Default: Alpha . Selects the channels of the Occlusion image which control occlusion of the flare. None: The flare is not occluded at all. Luma: The flare is occluded by the luminance of the Occlusion clip. Black areas will show the flare, and white areas will obscure it. Alpha: The flare is occluded by the alpha channel of the Occlusion clip. Use this if you have an RGBA clip of an object that should appear in front of the flare. Invert Occlusion: Check-box, Default: off. If enabled, inverts the Occlusion clip so the flare is obscured by black areas instead of white. Use Color: Check-box, Default: on. If enabled, colorizes the flare based on the color of the Occlusion clip. Use this to create stained glass effects when the Hotspot passes behind a transparent object. Diffraction Glow: Default: 0, Range: 0 or greater. Creates a glow on the edges of occluding objects that are near the hotspot, to simulate light bleeding around the edges of the object. This parameter controls the brightness of the glow. Glow Width: Default: 0.4, Range: 0 or greater. The width of the Diffraction Glow. The color of the Diffraction Glow. Glow Radius: Default: 0.2, Range: 0 or greater. The distance from the hotspot at which Diffraction Glow is visible. The glow will fall off softly as distance from the hotspot increases. Objects outside this radius won't create any glow. Occlusion Scale Brightness: Default: 1, Range: 0 or greater. Enables a Trigger that adjusts the brighness of the flare as it's occluded. The brightness will ramp up to this value when the Hotspot is 50 percent occluded, then ramp back down to its normal brightness. At the same time, the flare will be fading out due to the occlusion, so its brightness will drop off quickly at the end. Works best when Occlusion Softness is turned up as well. Occlusion Scale Widths: Default: 1, Range: 0 or greater. Enables a Trigger that adjusts the size of the flare as it's occluded. The flare will expand up to this amount when the Hotspot is 50 percent occluded, then shrink back down to its normal size. At the same time, the flare will be fading out due to the occlusion, so it will appear to shrink quickly at the end. Works best when Occlusion Softness is turned up as well.